Adam Schiff wants to know who Donald Trump Jr. telephoned as he was organizing the meeting at which he was promised dirt on Hillary Clinton. The chairman of the House intelligence committee told NPR he intends to use his power to convene hearings, call witnesses and get information to answer the question about whether Trump Jr., in setting up the June 2016 meeting at Trump Tower, spoke to his father, then-candidate Donald Trump. The intelligence committee has "the ability to find out and we will find out," Schiff told Morning Edition in an interview that airs Thursday. Trump Jr. made a number of contacts in order to organize the meeting at which he, brother-in-law Jared Kushner and then-campaign chairman Paul Manafort met with a Russian delegation following the offer, via intermediaries, of support for his father's presidential campaign. A few of the calls Trump Jr. made were to a blocked number. Other witnesses have told Congress that Trump used a blocked number. Trump Jr. told members of Congress he didn't remember who he called. Schiff said the intelligence committee will not "go into all the president's phone calls or all the president's finances," but he said it's the panel's "job to find out whether a foreign power holds leverage over the president." If investigators could establish that Trump Jr. spoke to Trump as he was organizing the June 2016 meeting, it could suggest that Trump Jr. told his father that he'd received an offer of Russian help for the campaign — and that would undercut Trump's longtime denials that he knew nothing about the Russian efforts to interfere in the 2016 election and damage Clinton. Trump has denied any conspiracy to coordinate with Russians to influence the election. He goes back and forth as to what he accepts about the "active measures" that Moscow launched against the West, but he has been consistent that the idea that his campaign had anything to do with those Russian efforts is a "hoax." In the last Congress, then-Chairman Rep. Devin Nunes, R-Calif., wrapped up the House intelligence committee's Russia investigation with a finding of no wrongdoing. The worst that could be said, the panel found, was that contacts between people on the Trump campaign and Russians were "ill-advised." Now with Schiff in charge and Democrats in the House majority, the panel is expected to hire new investigators, including a former prosecutor and a money laundering expert. 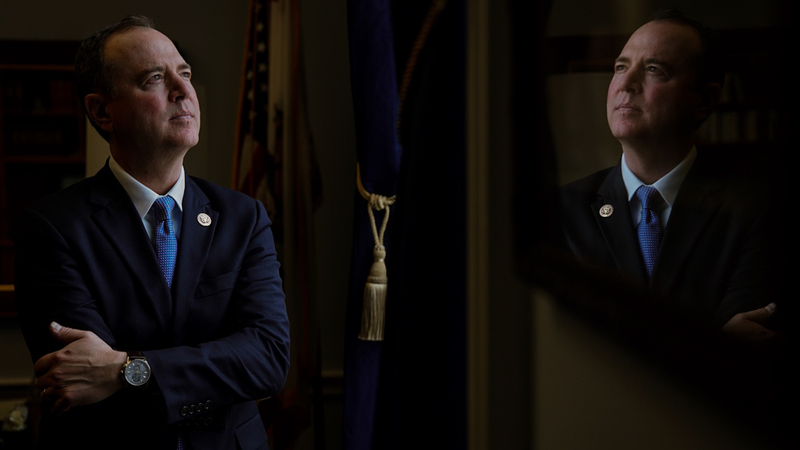 The committee's first hearing this year will examine the perceived rise of authoritarianism around the world, Schiff said. But the investigations into Russia will garner more public attention. Schiff said he wants Michael Cohen, Trump's former personal lawyer who has been sentenced to three years in federal prison for multiple crimes including campaign finance violations, to appear before the committee this year. Cohen also is scheduled to testify before the House oversight committee next month. The White House Cousel's Office has been reportedly adding attorneys to prepare for legal fights with Democrats. A number of incoming Democratic chairmen beyond Schiff — including Elijah Cummings, D-Md., of the oversight panel, and Eliot Engel, D-N.Y., of the House Foreign Affairs Committee — want to expand investigations into Trump. Schiff told NPR he expects the administration "to stonewall" his committee "on any legitimate oversight it does." One battle could involve whether the committee will again try to subpoena the interpreter who was present for Trump's meeting with Russian President Vladimir Putin in Helsinki last July. Recent reports show the president has gone to unusual lengths to keep secret the details of what he's said to Putin in meetings in Finland and elsewhere. Schiff said he's "examining the legal issues around either bringing in the interpreter, or getting the interpreter notes, or finding out through others in the administration what took place." The White House may argue that Trump's dealings with interpreters and other staff members are protected under executive privilege, but Schiff called that interpretation of the privilege "superficial," since the inquiry isn't focused on what American officials have been saying to each other inside the administration. "We're not interested in when he was talking to his counselors," Schiff said of the president. "We're interested in what he was talking to Vladimir Putin about, and doesn't seem to me that any privilege applies there." Transcript of the interview between NPR's Steve Inskeep and Rep. Adm Schiff, D-Calif. The interview has been edited for clarity. Inskeep: I want to just begin by understanding how you see your new position here. How do you intend to run this committee differently than your predecessor? Schiff: Well I have to think in just about every way. You know, certainly as it pertains to the Russian investigation we want to go back to the original mission which was to follow the facts wherever they lead and try to conduct this in a bipartisan way. You know probably going back to the midnight run. The then-Chairman Nunes late night excursion to the White House to get information that he would later present to the White House says demonstrating some Obama conspiracy to surveil the Trump campaign going back to that date. The Republicans left essentially trying to find out what the Russians did and how they did it and the role of the Trump campaign and embarked instead on an investigation of the investigators became essentially a surrogate for the Trump defense team. Obviously that's going to change we're going to go back to our original mission of following the facts. So we're already reaching out to witnesses that we wanted to come in but we couldn't get the then majority to either request or subpoena. We're going to get documents that we need to get to do our investigative work. But more broadly we want to take a deep dive on issues that we think have been neglected and our first open hearing next month will be on the subject of the rise of a- on the subject of the rise of authoritarianism around the world. And this to me is the much bigger picture than Russian interference in our election, bigger even than Russian interference in the elections of others that has been going on for some time in Europe and elsewhere. We see a real rise of autocracy around the globe everywhere from the Philippines with Duterte to Turkey with Erdogan, Al-Sisi in Egypt the rise of the far right in Hungary and Poland. That challenge to liberal democracy is going unanswered by this administration. And we want to shed light on this. Inskeep: Why would you begin the Russia investigation again, granting you didn't like the way that Devin Nunes did it or that his colleagues did it? There's been a Senate investigation that was seen as credible and bipartisan. There's the Mueller investigation . What could you add? Schiff: Well, first of all, we never shut down the Russia investigation. The Republicans walked away from it, but we continued to bring in witnesses, but we didn't have the power to subpoena them or compel their testimony. And that didn't allow us to do a thorough job. In fact the report the Republicans issued has already been completely discredited. They relied on for among other things. Michael Cohen's testimony and other witnesses without checking to see whether any of it was accurate. Now that's no way to conduct an investigation. Inskeep: Cohen has since admitted to lying under oath. Schiff: He has and we are going to be bringing him back before the committee to explore what areas were truthful and what weren't. And it's not just that we need to bring back certain witnesses. There are a great many that have never come before our committee, a great many unanswered questions and even had we been able to continue uninterrupted — and we've lost about nine months of time — the special counsel's investigation continues as does the Senate intelligence investigation. And we see in the testimony of Bill Barr just how important it is that the congressional investigations go on and I say that because Barr testified that he is not committing to sharing the Mueller report with the Congress or the country. Inskeep: This is the attorney general nominee. Right. Schiff: Exactly. And we, I guess, can expect he's going to give us a "Cliff Notes"
version that he will write himself. This means that the country may never learn about information that does not go into an indictment. And that just is completely unsatisfactory. The country deserves to know what the Russians did in our elections, what role the president played or his campaign associates played. And to have a situation where the nominee for attorney general says you can't indict a sitting president, you can only impeach one if it's warranted — but we're not going to give you the evidence to determine whether impeachment is an order — means we're not gonna have a rule of law. We're going to have immunity. And that just cannot persist. Inskeep: You think it is worth then going over the very same ground Mueller has gone over perhaps because you can do it in a way that you would develop public information. Schiff: I think there are areas that Mueller may not be investigating that need to be investigated because he may or may not be given the charter by the deputy attorney general or acting attorney general. Schiff: Money laundering. Were the Russians laundering money through the Trump businesses? This compromise the Russians hold over the president of the United States — we don't know the answer to that question, but we also don't know whether Bob Mueller has been allowed to investigate that issue. The president has tried to draw a red line around it. In my view, the president has no business drawing red lines. But nonetheless we don't know whether that has been investigated. But we do know it needs to be. But even areas where Mueller is investigating if it's going to be the position of the incoming attorney general, should Barr be confirmed, that the public doesn't get to learn about this, then it will fall upon Congress to share with the American people what happened and we will do that in several ways. We will do that by trying to compel that report to be provided to Congress but we'll also do it by developing the record ourselves and by sharing with the country the product of our investigation. Inskeep: Is that why you were hiring among other staff members a former prosecutor and an expert in money laundering? Schiff: We are adding to the investigative capabilities of our committee in our staffing when we began the rush investigation. Our staff was what you would expect an intelligence committee staff to be comprised of — largely analysts, experts in the intelligence community, experts in doing oversight of the agencies so that we could make sure that they were sharing information to protect the country, not stove-piping it. That was one of the problems identified in the 9/11 Commission report ... The Constitutional and statutory obligations are being met but then we have this huge investigation also added to our responsibilities. But our staff were still the same analysts. Now over time we brought on additional staff. But there is still considerable need to bring on more investigative heft. And so we are interviewing candidates with an eye towards doing that. Inskeep: And what I said is correct: A money laundering expert ... a ... former prosecutor ... will be on that staff? Schiff: You know, I can certainly share with you that we are going to be hiring people with investigative experience. And while I don't want to go into the particulars until we have people on board we're ready to share that information. We are looking to fill areas of expertise that we don't feel we have sufficiently in place and because the end of the day we want to make sure that we can represent to the public we've done a thorough and credible investigation and this is what we were able to find. Inskeep: It has been said that the president, before he became president, did large scale real estate deals and paid for a number of them in cash rather than financing, which is unusual in real estate. Do you intend to find out where the cash came from? Schiff: Well we are certainly going to try to follow the money and the president's sons have also said — this compounds our concerns at various points in time — that they don't need the help or money from U.S. banks. They get all the cash they need from Russia. Inskeep: This is a quote from one of the president's sons about a decade ago. Schiff: Yes. And I think one of the sons also said that a disproportionate share of their assets come from Russia. Now, the president has tried to disavow those remarks much like he has tried to disavow comments that he himself has made in the past that he was getting tens of millions of dollars from the Saudis and why shouldn't he like the Saudis the Saudis are spending so much money on his properties. If foreign money is influencing his decisions, that's a problem. If foreign business entanglement, lawful or unlawful, is compromise that the Russians or others hold over the president of the United States, that's a problem and it needs to be exposed. Inskeep: Let me ask about one detail that many people have asked questions about: There was a famous meeting as you know in 2016 involving Donald Trump Jr., Jared Kushner, top campaign officials and a Russian lawyer. There were two phone calls from Donald Trump Jr. to a blocked number before and after that meeting, if I'm not mistaken. Do you have the ability to find out who he called and do you intend to find out? Schiff: We do have the ability to find out and we will find out. And what you're referring to is in the setup of that meeting, and, by the way, two of the people in that meeting have been indicted already: Manafort, the campaign chairman, and Natalia Veselnitskaya, the Russian attorney, who we have learned more and more about and her relationship with the Russian government. In the setup of that meeting, the son of a Russian oligarch arranges to speak with Don Jr., the president's son. The president's son is informed in advance of these conversations that the Russians have "dirt" on Hillary Clinton that they want to share as part of what is described as the Russian government effort to help the Trump campaign. And the president's son's reaction is that he would love that help. And so there are these calls going back and forth between Don Jr. and Emin Agalarov, the son of Aras Agalarov, an oligarch close to Putin. Oddly enough Aras Agalarov is known as the "Russian Donald Trump" because he's a real estate magnate in Russia. Sandwiched between these calls where the president's son is trying to find out, "Is this a meeting I should take, is this offer for real, should I bring in the campaign chairman, my brother in law?" There's a call from a blocked number. We need to find out who that blocked call is from. Inskeep: And this is knowable? The phone company has this information? It can be subpoenaed? Schiff: It's perfectly knowable. And of course when we brought in Don Jr. and asked him about the call and the obvious question was, "We know that then-candidate Trump used a blocked call during the campaign. Was this call from Dad?" And when we sought with our Republican colleagues to get an answer in the most definitive way possible — that is get the phone records — the response from the Republicans was, "No. We don't want to know." Now, I can't imagine a more obvious investigative step than getting those phone records, but we were denied the ability to do that and that, in microcosm, was what the Republican-led investigation was about. It wasn't about finding out answers. It was about going through the motions of investigation so that a political report could be issued and they could absolve the president. That's not what they promised the American people they would do, but that is what they did. So we still need to get answers and one of the places we will begin is by getting those phone records. Inskeep: If you're going into all the president's phone calls, if you are going into all the president's finances, and perhaps an extensive look at his business career, at what point would that become a witch hunt? Schiff: Well we're certainly not going to go into all the president's phone calls or all the president's finances. You know, whether the president was engaged in shady business transactions with people, that's not my job to find out. It is my job to find out whether a foreign power holds leverage over the president. So what I am concerned about, what we do need to look into is: Was he doing business with the Russians? Was it lawful business? Is it business that he is now denying and do the Russians have leverage over him? And to give you a perfect illustration of why this is so important, we've already learned through Michael Cohen that the business that he was trying to cultivate during the campaign went on much longer than has been acknowledged in effect. Quite the contrary. Michael Cohen testified it was over at the beginning of the year 2016. We now know it went on through the middle of that year. Even when Donald Trump was the presumptive Republican nominee for president and was denying any business dealings with Russia, he was in fact pursuing a multi-multi-million dollar project in Moscow and seeking the Kremlin's help to make it happen. Now, the Russians knew this even as the president was denying it ... the Russians were on the other end of that transaction, which means at any point in time of the Russians' choosing they could expose the president's falsehoods about this and that is compromise. Now it's come to the public's attention recently the president may have tried to acquire or destroy the records of his private conversations with Putin over the last couple of years. Why is that? Why does he demand to meet alone with Putin? Why does he demand that there be no record of his discussions with Putin? This is extraordinarily worrying behavior by the president of United States. Inskeep: Last year when you did not have the power, you had to ask Republicans. You called for the interpreter from the president's private meeting with Putin in Helsinki, Finland to be subpoenaed to testify. Now that you do have the power, do you intend to subpoena that interpreter? Schiff: We intend to do everything we can to find out what took place in these private meetings and we are examining the legal issues around either bringing in the interpreter or getting the interpreter notes or finding out through others administration what took place. Inskeep: What are the legal issues? Schiff: Well, you know, they may make a superficial claim of executive privilege but when you look at executive privilege, that privilege applies when the president is talking to his advisers, seeking their counsel and the policy reason behind it is that he should be able to get the unfettered advice of his counselors to make decisions. But we're not interested in when he was talking to his counselors about. We're interested in what he was talking to Vladimir Putin about and doesn't seem to me that any privilege applies there. But that doesn't mean they won't claim one. And so we are investigating the legal issues around it. At the end of the day though, we need to find out whether the president behind closed doors is sacrificing U.S. interests because of some personal motivation. That's to me is the overriding and compelling interest here. Inskeep: Could there have been a comparatively innocent explanation for the president not wanting to tell other people in the government about his meetings with Putin? He clearly doesn't trust a lot of people in the government. He talks constantly about a "deep state." He may simply not have believed that other people in the government could be relied upon with this information. Schiff: I suppose if you work really hard at it you can fashion a rationalization for his behavior. But if you look at what he does quite overtly, what he did in public with Vladimir Putin when in Helsinki, for example, he said, "Well, I've got my intelligence agencies telling me you interfered in our election but you're telling me you didn't and I don't know why you would." Basically, I believe you over our intelligence agencies. If he is saying that publicly, what is he saying privately? That seems to be the far more probable issue, that he does not want the public to know what he is saying, to the degree that he doesn't trust the people around him, perhaps because they recognize that what he is doing, as indeed General Mattis did, is inimical to our national interests. Inskeep: If the White House disagrees with you about executive privilege on a matter like the president's interpreter, you're prepared to go to court? Schiff: Well, this is a decision that we will have to make in discussion with our leadership and I'm already coordinating with Eliot Engel, the chair of the Foreign Affairs Committee, because what we are going to have to do as an over-arching matter is prioritize what fights we're going to have with this administration. We know they're going to stonewall us on whatever legitimate oversight we do and it means we're going to have to put our most important fights first and make sure that we are prepared for them. And so that's a decision we will have to make. But to me it seems imperative that we know whether the president of the United States is doing our bidding or his own family's bidding when he's in private discussions with a foreign adversary. Inskeep: When you were saying the reasons you need to redo this investigation, you said that William Barr, if he's attorney general, may not give you the evidence that you would need to decide whether something impeachable has taken place. And so you're doing your investigation. Can we then draw that conclusion that that is where this may be headed? That the purpose of this investigation is to find out whether there is an impeachable offense first? Schiff: You know again we have never stopped the investigation so I wouldn't say that we'll need to redo it or reopen it. But we will need to continue it until we get answers until we are able to follow the facts wherever they lead. I don't want to prejudge what the conclusion is. In terms of what the remedy ought to be I'd like to finish our work. I'd like to make sure that we get the product of Bob Mueller's report as well. My point is that we can't have a situation where the president is effectively immunized against any consequence because the Justice Department takes the view that notwithstanding whether they would find evidence of criminality he cannot be indicted and that they will not share evidence with the Congress that would allow Congress to pursue any other remedy. That simply cannot be the policy of the Congress or the Justice Department that the president is above the law because that would effectively make the president above the law, neither subject to indictment nor impeachment. Inskeep: Is there any other aspect of the intelligence agencies that comes under your vast purview that has nothing to do with the president of Russia that strikes you as urgent that you need to dig into? Schiff: Certainly I will. I don't know that I can say that has nothing to the president because, you know, all of the national security challenges facing the country in one way or another implicate presidential action. But we also expect to do a deep dive on Saudi Arabia to learn more about the murder of Jamal Khashoggi. We need to analyze the Saudi role in Yemen, the Saudi role in Syria, the Saudi role in the peace process ... how stable is the House of Saud. What are the risks to placing so much reliance on the crown prince? We're gonna do a deep dive on all those issues. We're also going to be examining North Korea. We've been assured by our president it's essentially "problem solved," we can all sleep well. Now, that is not what we're seeing. We are not seeing a North Korea on an inexorable path towards denuclearization. So we'll continue to do a heavy focus on North Korea as well as on Iran and the threat posed from Iran. And we will be devoting a lot of our attention to the war zones like Afghanistan and Iraq and Syria and Yemen for the risks they pose to us from a counterterrorism point of view but also the risks they pose to our men and women in uniform. Inskeep: Do you expect this committee to do more of its work in public than it traditionally has? Schiff: Yes. And, you know, even, you know, very basic public hearings were foreclosed by the previous majority for reasons I'm still not clear about. We have traditionally done quarterly worldwide threats hearings — open hearings that are followed by a closed session in which the leaders of the intelligence agencies testify publicly about what's keeping them up at night. As I mentioned, you know, our first hearing will be hearing an open hearing on the rise of authoritarianism. I want to do a lot more in open session. We're also going to look at within the Russia investigation what hearings or witnesses we might be able to bring in in an open session as well as releasing transcripts of witnesses who have come before our committee, so those are things all things that we are exploring. Inskeep: Should William Barr recuse himself from the Russia investigation if he's confirmed as the new attorney general? Schiff: I do think he should. And I think it's astounding that we are at a point in history now where the ethical bar has been so lowered that an attorney general nominee can come before the U.S. Senate and say, "I'm not willing to commit that I will follow the advice of ethics lawyers at the Justice Department." Is this really where we are? Shouldn't we expect at a minimum that any attorney general will agree to follow the advice of ethics lawyers? I think the problem here is he knows what that advice is going to be and that advice is going to be just the same as the advice to [Acting Attorney General] Matt Whitaker and for precisely the same reason: You have expressed publicly hostility to the Mueller investigation. You will not have public confidence if you play a role in that investigation. You should recuse. The reason why he won't commit to follow their advice is because he knows what their advice is going to be and because if he were willing to do so, he would not have been nominated. That's a problem. We should demand better than that. You know it's astounding to me that the only two people apparently qualified to serve as acting attorney general or new attorney general are people who have already weighed in against the Mueller investigation before they were even appointed or nominated. That just shows how low the bar is. I don't think we have to accept that I don't think we should accept that there are a great many very well qualified conservative lawyers who could be nominated for attorney general.